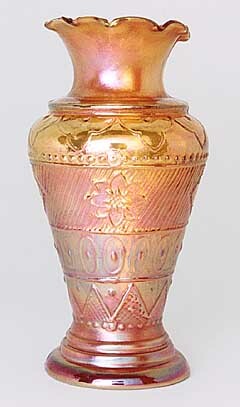 One of a number of similarily shaped 6-inch vases made by Jain of India. This one has several primitive patterns around the trunk. These were quite scarce in the late-1990s and were bringing substantial prices. One sold for $400 in 1998. They have have since dropped in value and are now selling in the $20 to $30 range. Also see CB vase.